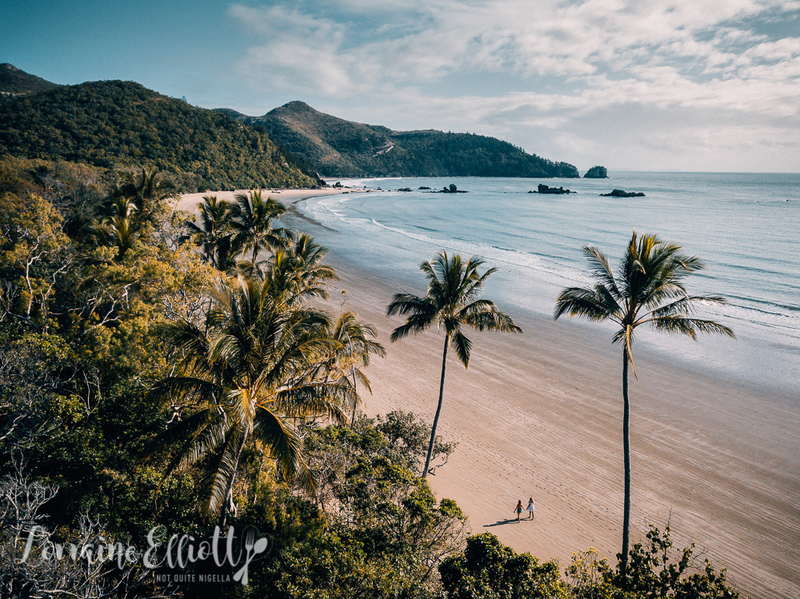 The lush, green area of Mackay in Queensland is just 1.5 hours away from Airlie Beach. 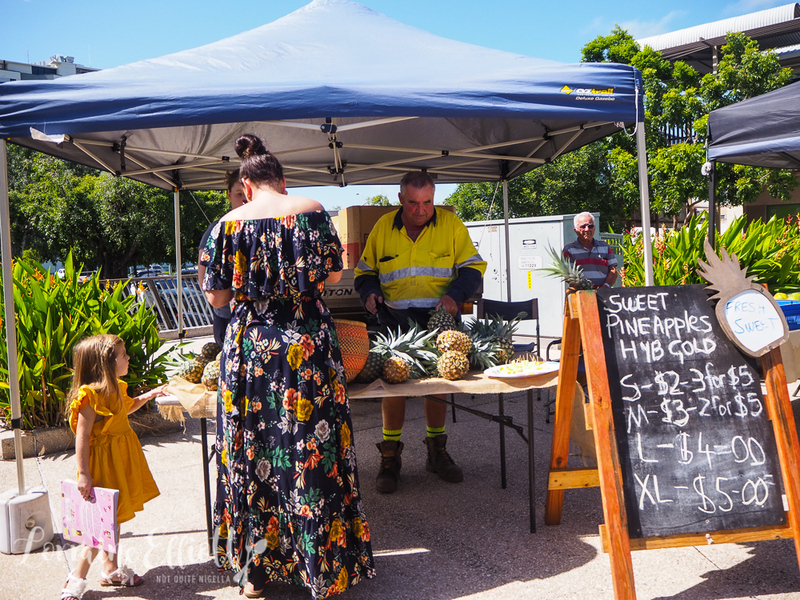 It's a area famous for sugarcane but it's also one where nature literally sits on your doorstep and one where the food scene is coming ahead in leaps and bounds with plenty of local and Queensland grown produce. Ivy busies herself with the rental car while I watch the sugar cane leaves flapping in the warm breeze as we drive past. It's the first time to Mackay for both Ivy and I and while we knew that it was famous for sugarcane, we had no idea that it is literally everywhere you look, even at the airport. As we touched down, I saw vast expanses of green swathes across the landscape. Early April is just after monsoon season and as a result the greens pop. 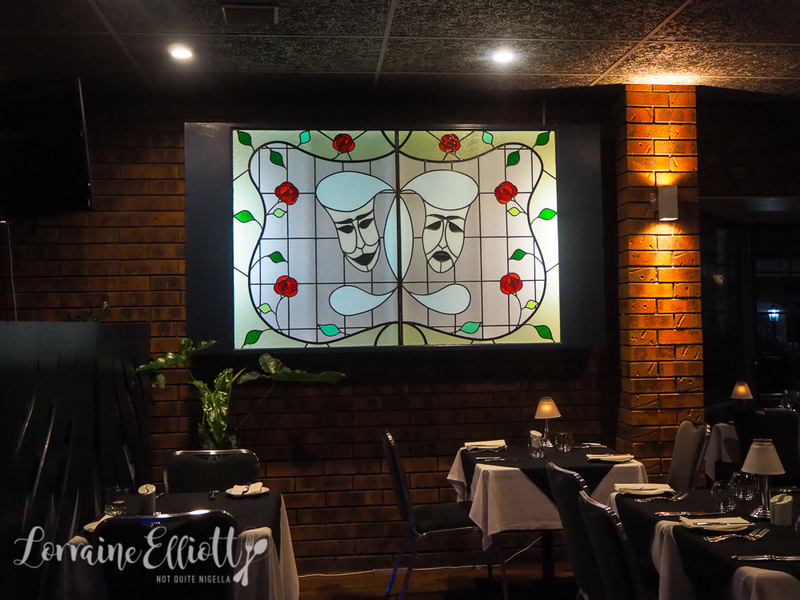 To orient ourselves we drive the adorably named Mango Avenue in Eimeo to the Eimeo Pacific Hotel, a faded retro blue pub that looks like it has stepped out of the movie set. From there you can have a coffee or tea while the view below shows St Bees Island. 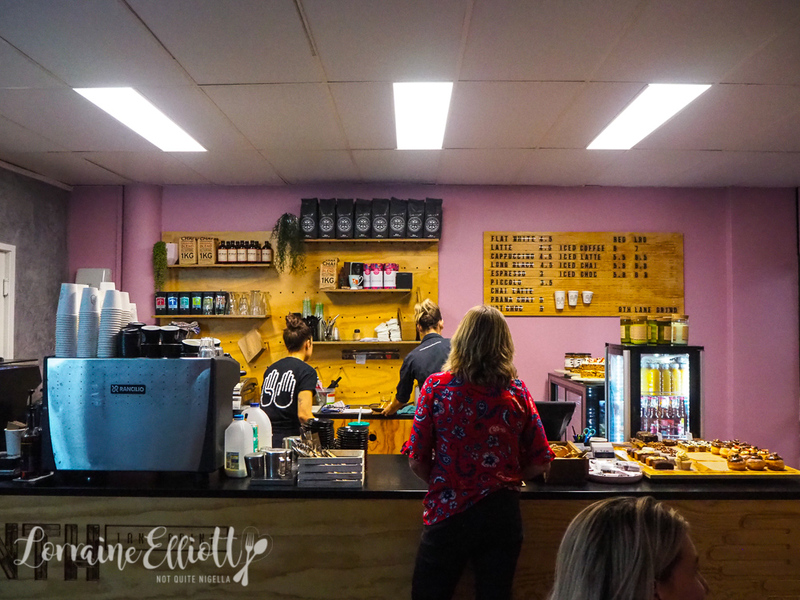 It's time for lunch and we visit 9th Lane Grind, a cafe located in the middle of town. 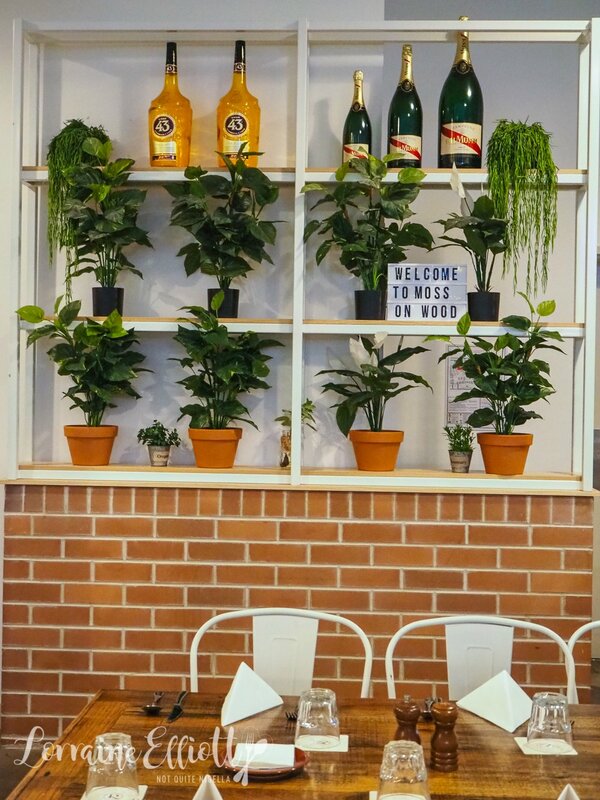 It has an on trend menu of cafe offerings along with a range of home baked cakes, sweets and donuts. Service is very friendly and we take a seat at an outside, undercover table. Drinks wise, my chai frappe is too good that even though I can't finish it because of its size, I take it to go so that I can sip on it all afternoon. 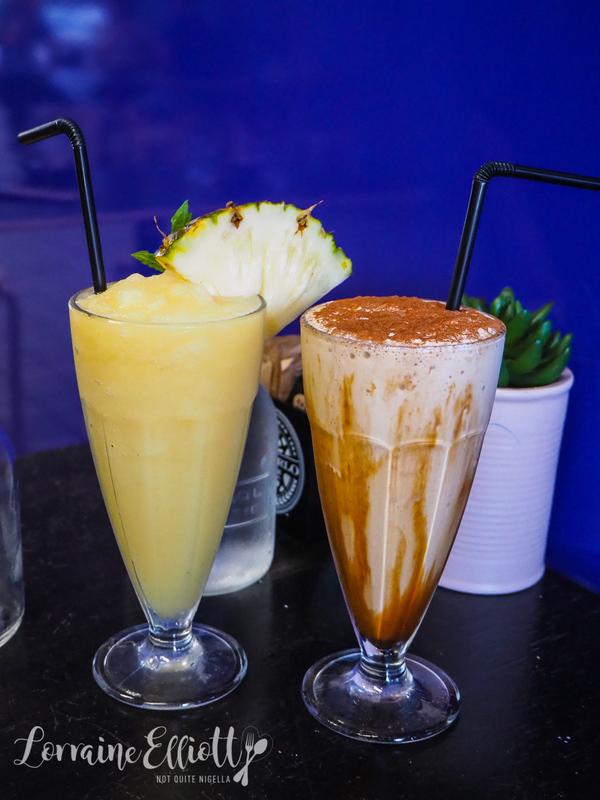 The non alcoholic pina colada smoothie is also full of fresh pineapple flavour. The creamy truffle mushrooms are just about the perfect breakfast or lunch dish. 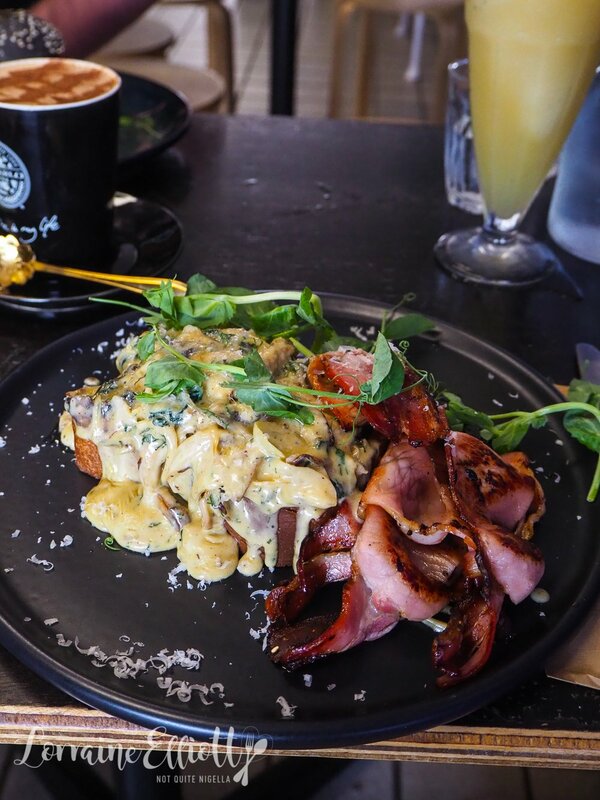 With a fat slice of downy soft brioche, a generous portion of streaky bacon, wilted spinach and creamy mushrooms in a truffle cheese sauce, forget calories or diets or any strange notions and just eat this and be happy with your life choices. It's so good that it doesn't even need bacon (but really who is going to ever leave bacon behind?). 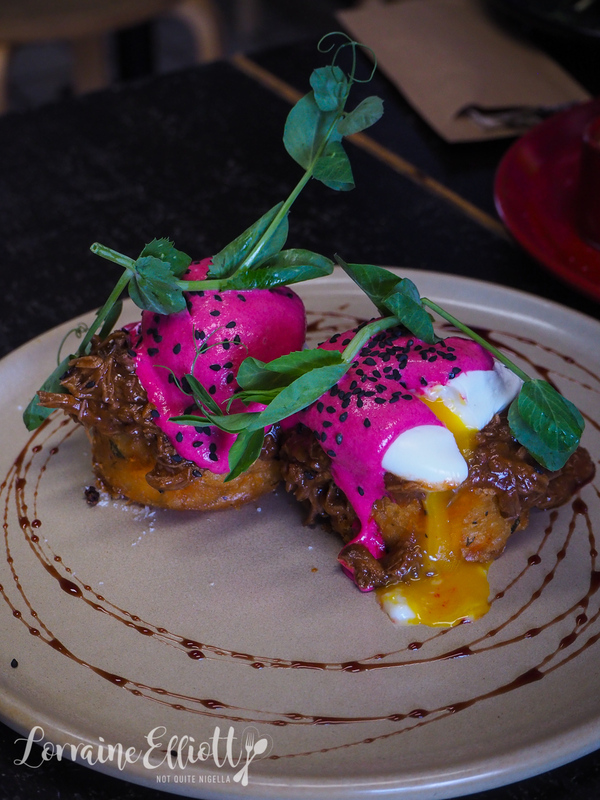 The beef brisket benny comes on two slices of bread with two poached eggs, potato hash, beetroot hollandaise and plenty of soft, saucy beef brisket in a barbecue style sauce. 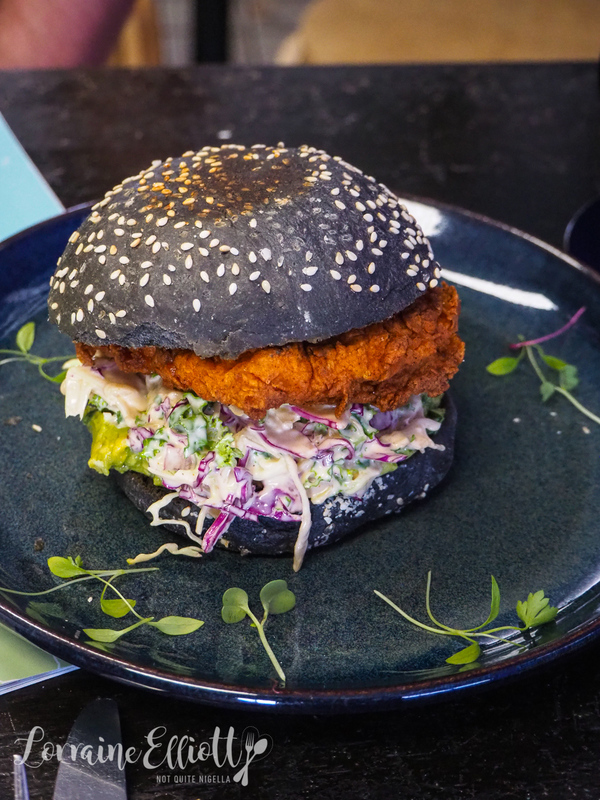 The fried chicken burger is luscious with a saucy kaleslaw, Sriracha mayonnaise and smashed avocado with a crispy deep fried chicken fillet all on a charcoal bun. It's creamy and crunchy and slightly messy but oh so good at the same time. And for the perennially greedy and undecided (guilty as charged!) 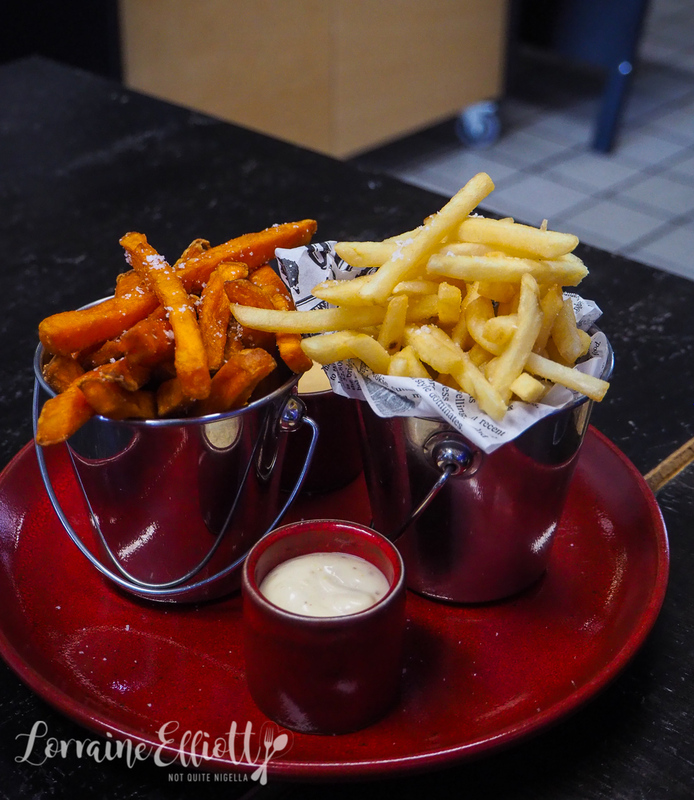 you can get both types of fries-shoestring with a salt and vinegar powder as well as excellent sweet potato fries with aioli. And for dessert? It's hard to choose because the cakes are calling me. 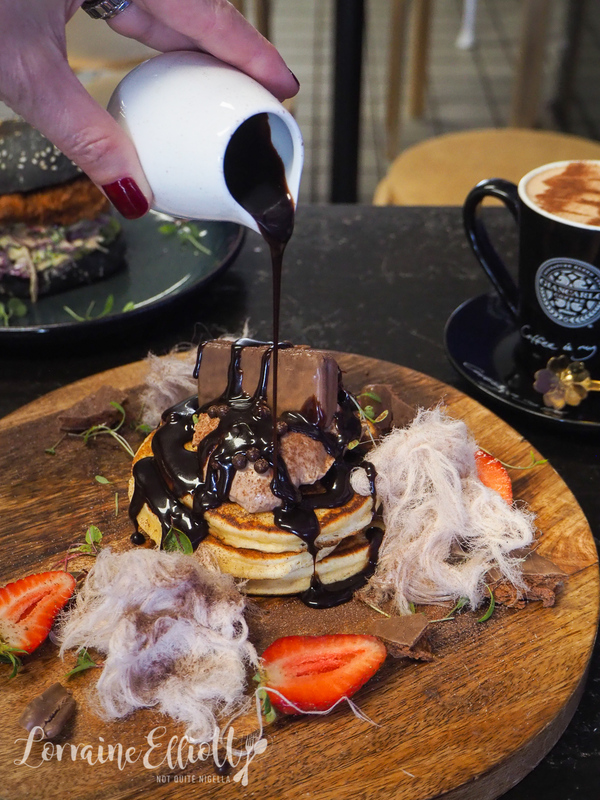 But we decide to try the Tim Tam pancakes served with Nutella mascarpone, chocolate fairy floss, dark chocolate pearls, berries and house made fudge sauce as well as whole and smashed up Tim Tams. It's enormous and rich but we had to start our trip off with a bang! Our first home for our Mackay stay is the Rydges Mackay centrally located right opposite 9th Lane Grind. 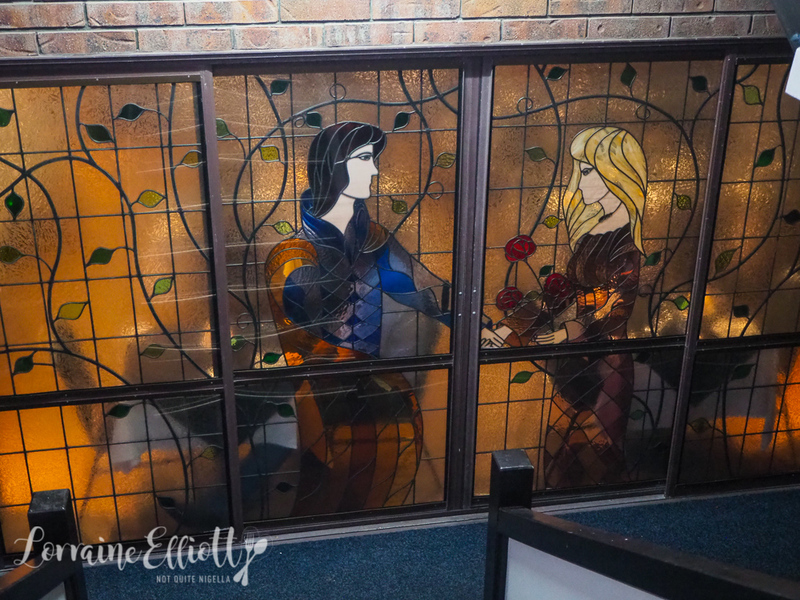 We have a connecting room with two separate entrances and separate ensuites. 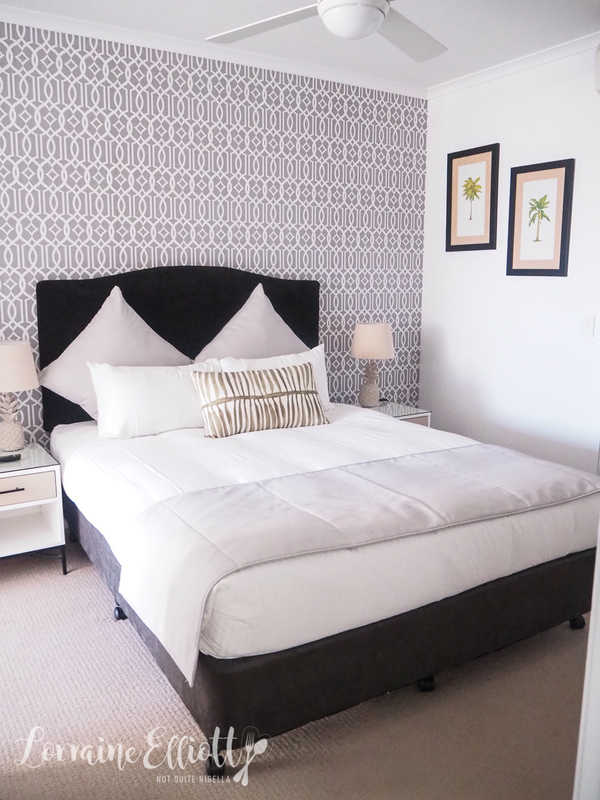 It's a spacious simply designed room with a king bed. 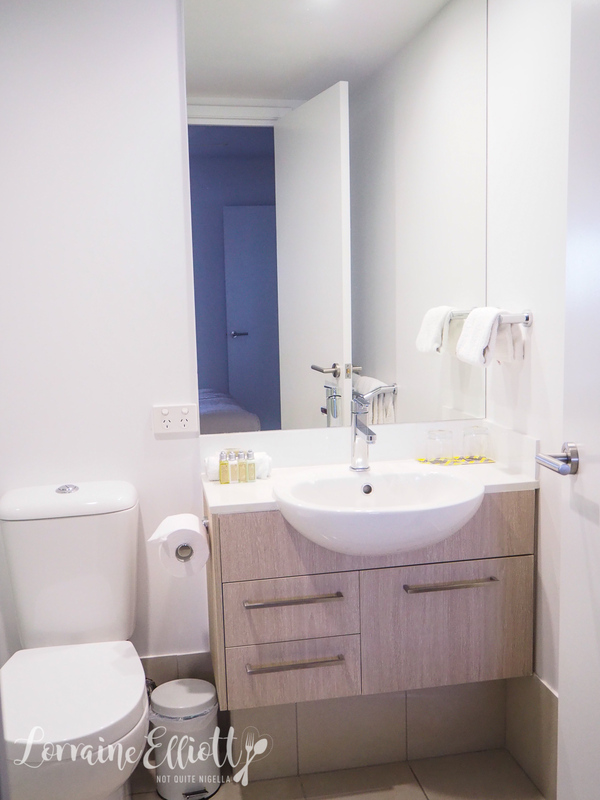 The bathroom is large with a spa bath and Biology toiletries while there is a separate room for the toilet. Service does vary somewhat but there is a really helpful staff member who assists me when I need to change rooms because the air conditioning wasn't able to be switched off in my original room. Once I move to my new room it doesn't have wifi in it. Downstairs is the Moss on Wood restaurant where there is a bar area as well as the restaurant at the front. We take a seat at one of the huge white wooden booths and order one of their steaks. The Black Angus rib fillet is from Darling Downs in Queensland and has been dry aged for 100 days. It's perfectly cooked medium rare and comes with battered fries and a salad with honey mustard dressing as well as a sauce of your choice. We chose the red wine jus and the peppercorn sauce, the latter being our favourite. 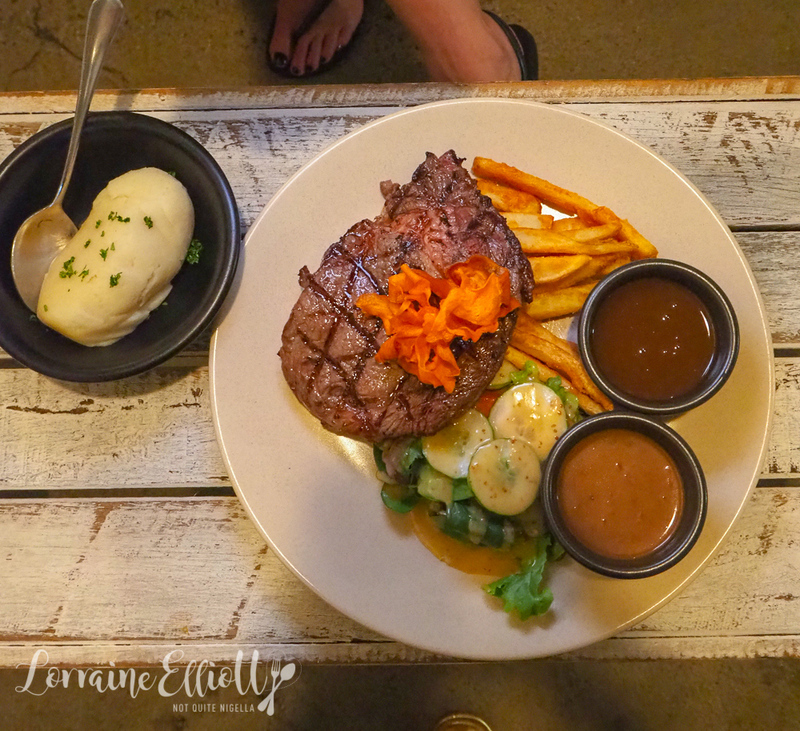 The steak is fantastic and we also order a side of potato puree made with real potato and it's such a satisfying meal especially when we spoon some of that peppercorn sauce on the potatoes. 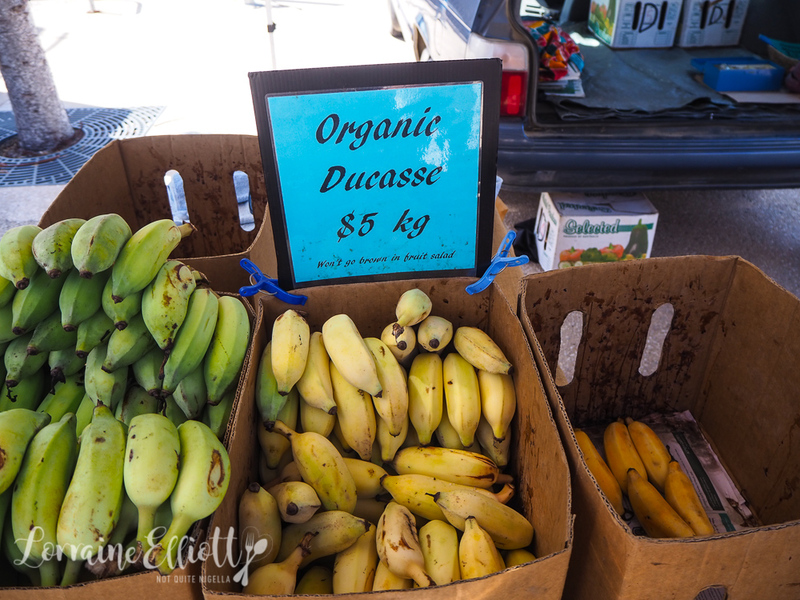 The next morning we make our way to The Greater Whitsundays Farmers Markets that are held every Wednesday at Bluewater Quay. It's a small but well stocked market with a good range of items from meats, fruit, honeys as well as other goods. 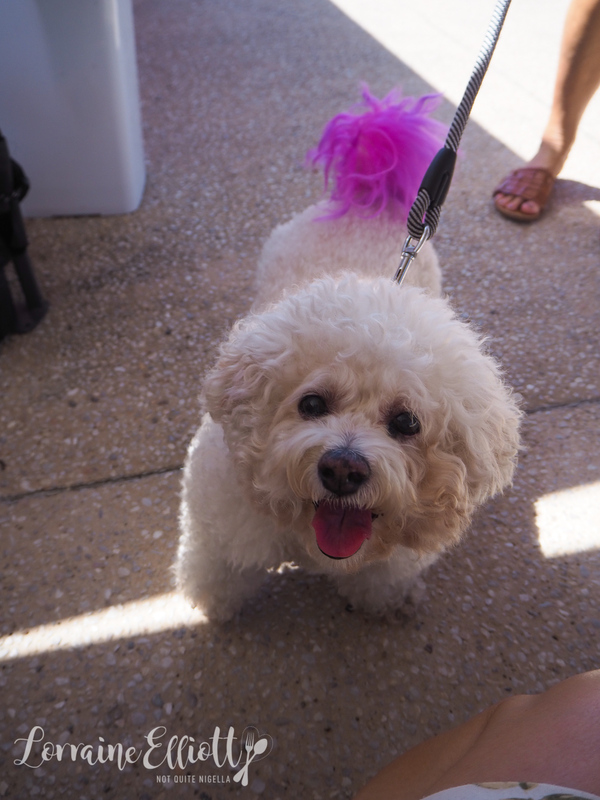 We end up buying some goats milk shampoo bars, lip balms and honeys and trying some samples of sweet Queensland grown bananas and pineapple and pet an adorable doggy called Audrey with a purple tail! After doing a spot of clothes shopping we head towards The Dispensary which is a bar as well as a breakfast, lunch and dinner eatery. 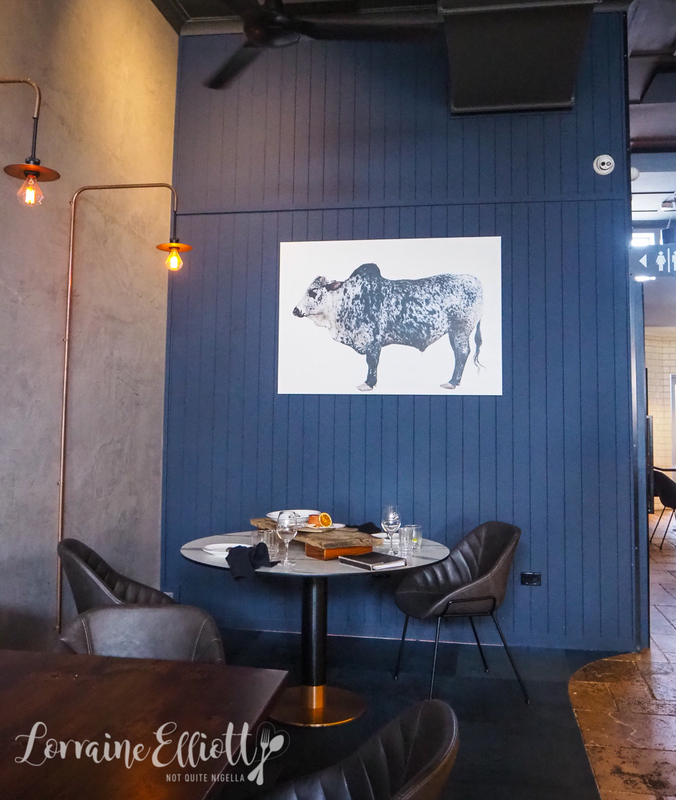 We take a seat under the large painting of a cow and settle into comfortable leather chairs for a feast. 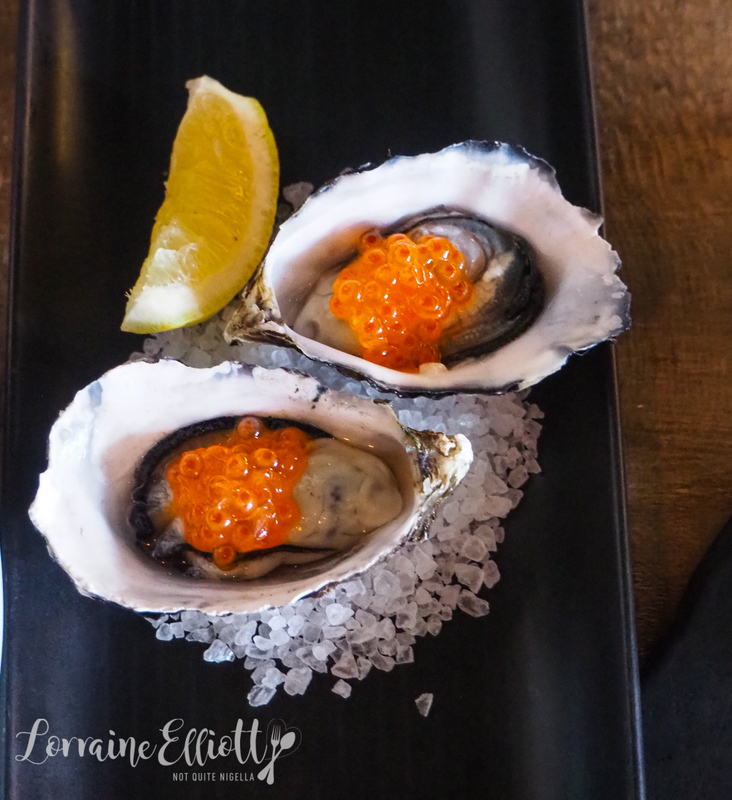 The freshly shucked oysters are served with fresh citrus and Yarra Mountain Ash triple smoked caviar. 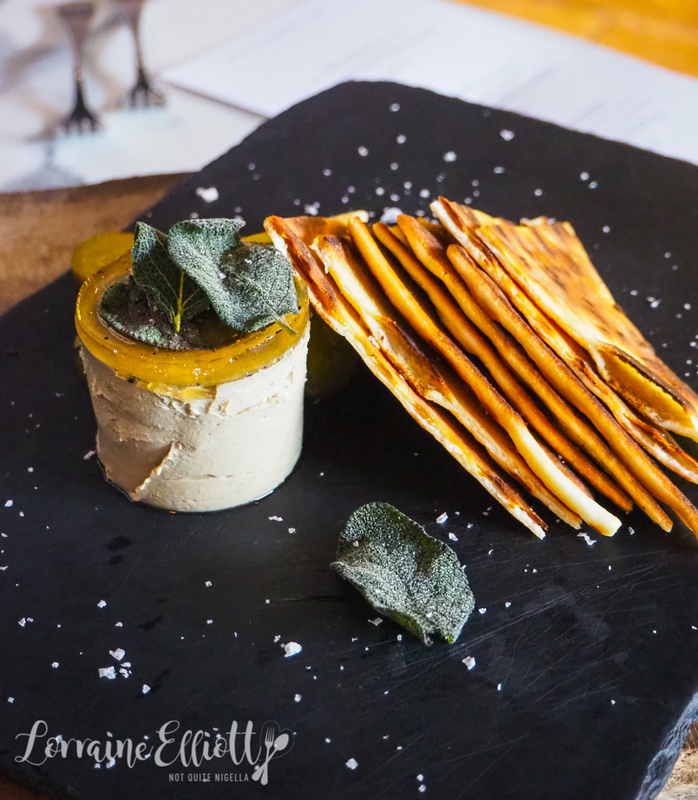 The duck liver parfait is flavoured with Cointreau, sage and orange jelly and comes with a generous serve of roti bread. The duck liver is quite a bit stronger than chicken liver but the onion pickles help pare back the intensity (just a bit more of them please). 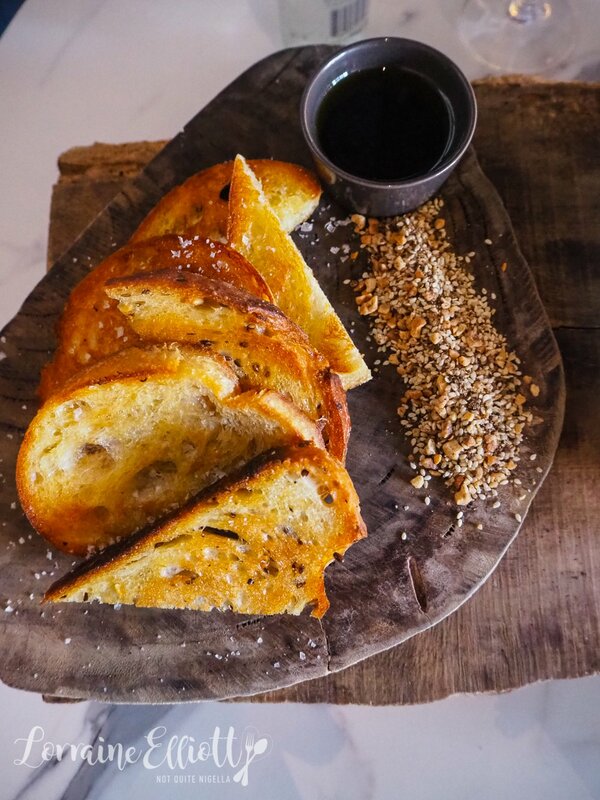 We nibble on slices of buttered, toasted warm bread with hazelnut dukkah, olive oil and balsamic glaze. Although we're trying a lot of food both Ivy and I can't resist another buttery slice of toast. 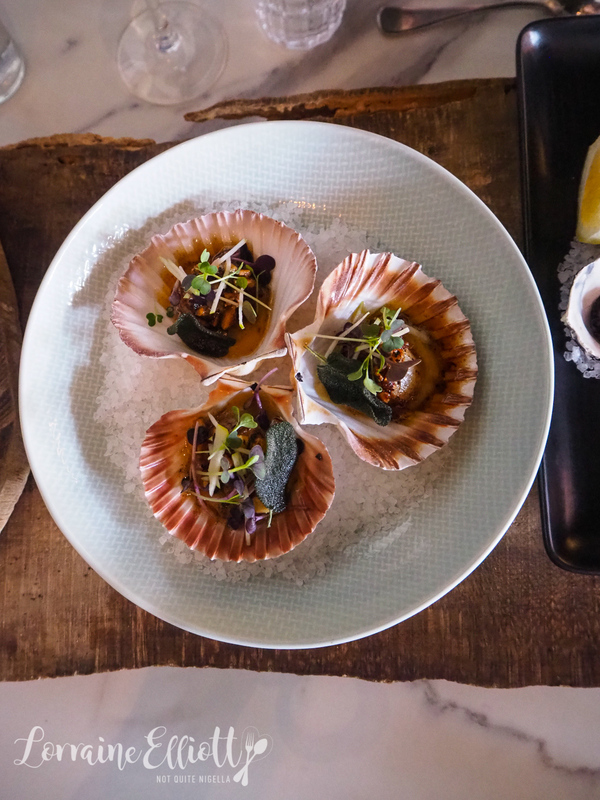 The grilled scallops are served on the shell with some smooth red apple puree, roasted hazelnut butter and apple micro salad and have a good balance of flavours. 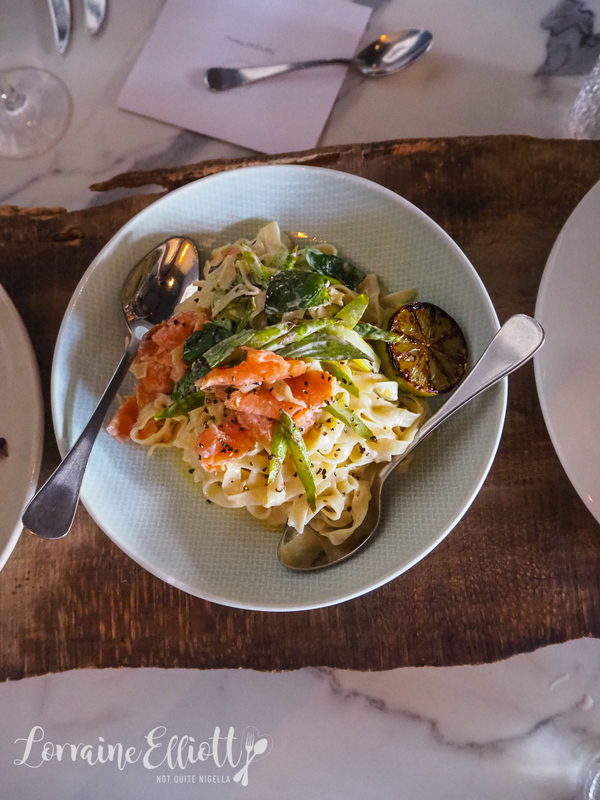 Mains wise, we are sharing three -the first is the fresh fettucine with lime crème fraîche, smoked salmon and grilled asparagus and basil. Our lovely waitress tells us that the teriyaki chicken and the fettucine are the two most popular dishes on the menu with the chicken being the most popular. 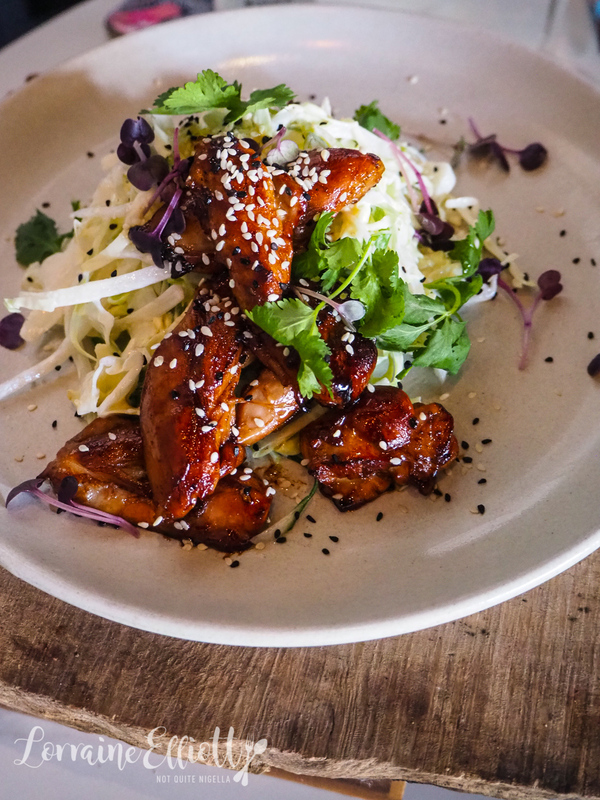 The teriyaki chicken is served with a sliced daikon and cabbage slaw in a horseradish dressing. We both like that it is served with a lighter side than rice because the weather is so balmy and warm. My favourite main is the sumac grilled local kingfish with crispy skin. 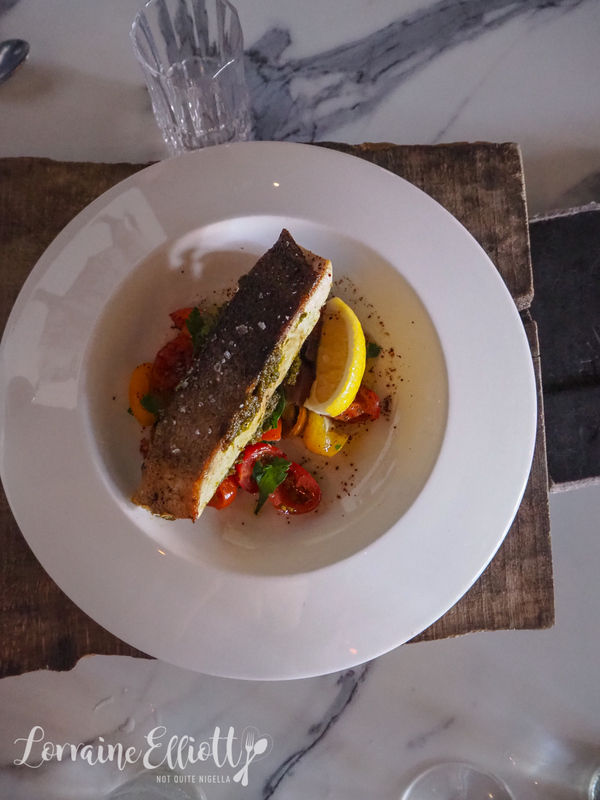 It's served on a bed of cherry tomatoes with a spiced chermoula. It's a simple dish but cooked well, the kingfish perfectly moist. And then we come to dessert. 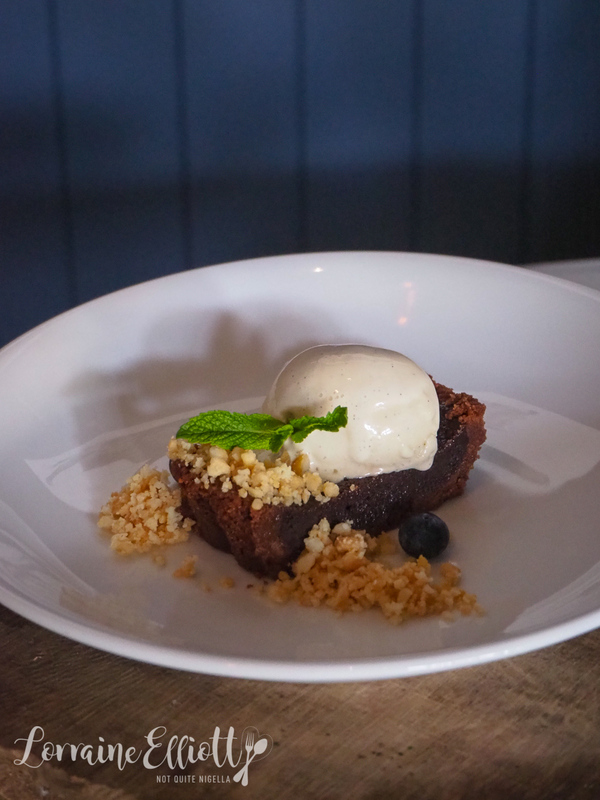 The dark chocolate tart is paired with a delightfully crunchy Queensland macadamia crumb and house made chocolate mint ice cream and blueberries. Ivy likes the serving size of this, it's not too overwhelmingly large or small and the tart has a nice dark intensity to it. While the crema catalana makes use of one of Mackay's biggest exports-sugar. 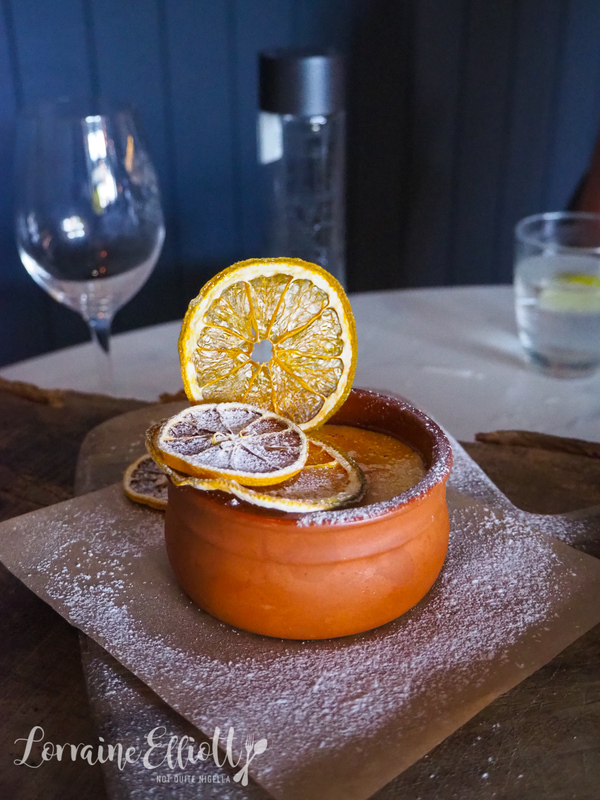 It's a lightly spiced crema catalana with orange and cinnamon and topped with torched Mackay sugar. 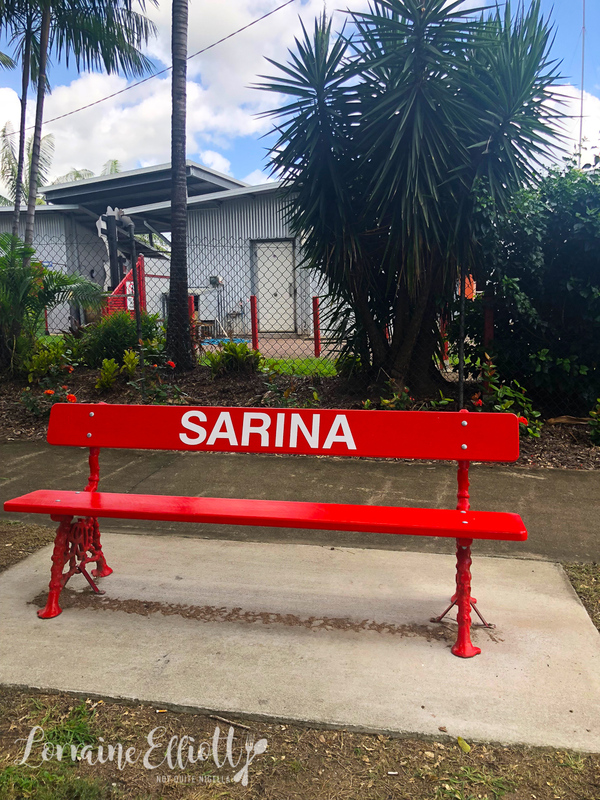 Speaking of sugar the nearby town of Sarina, around 40 minutes drive is home to the Sarina Sugar Shed. They hold four tours daily that detail the interesting history of sugar in the region. It's well worth doing as it is actually really fascinating. Our fantastic guide Trudy tells us that 95% of Australia's sugar is produced in Queensland. 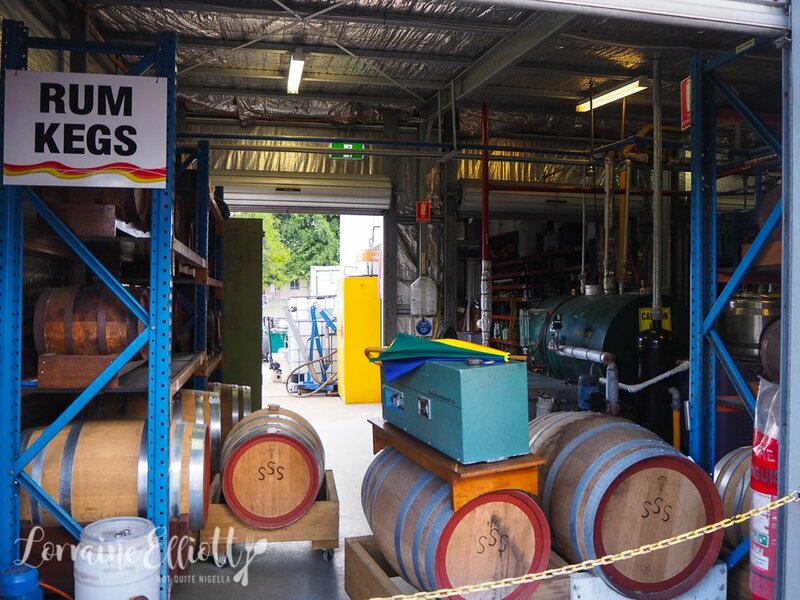 Mackay itself processes around 6-7 tonnes of sugar cane a year. She explains the sugar cane harvesting and growing process to us that starts with small pieces of sugarcane on the ground. 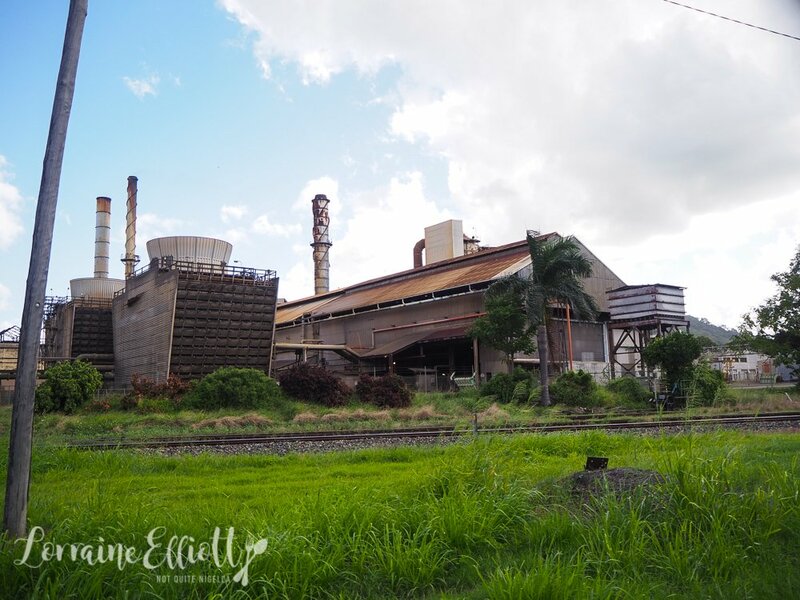 The "eyes" on the sugar cane sticks or billets grow the sugarcane which rises to the sky and this process of "planting" the sugar only has to be done every 2-5 years. Sugar cane needs heat humidity and lots of rain or irrigation. The top leaves of the sugar cane makes the sugar by accessing sunshine but the sugar is stored in stalks and when harvested they do not need the leaves (they can cause problems with the harvesting machines). Decades ago, sugar cane farmers used to burn the sugar cane but that is largely an abandoned process with many just cutting down the leaves to make a trash bed on the ground that breaks down to become nutrients in the soil. There are 30-40 varieties of sugar cane grown in this area although there are around 160 varieties in total. The farmers help to fund research into finding more disease resistant varieties. And when it comes to harvesting and selling the sugar cane, the farmers are paid by the sugar level in their cane. Trudy then takes us to the factory to explain the process of how sugar is made in their micro factory. It is first crushed and then they add natural lime to have the mixture reach a ph level of 8 so that it won't rot or deteriorate. It is then heated to 104C/219F to kill bacteria. A flocculant is added to clarify the mixture much in the same way that egg white is added to wine. From an original 80 litres of juice you will get 20 litres of syrup to work with. From this syrup you grow the sugar crystals using a process called "shock seeding" which starts to crystallisation process. They inject raw sugar crystals, raw sugar syrup and air and then the sugar crystals start to form. The longer they sit in the pan the larger the crystals. 7 tonnes of sugar cane will reduce down to create 1 tonne of sugar crystals. 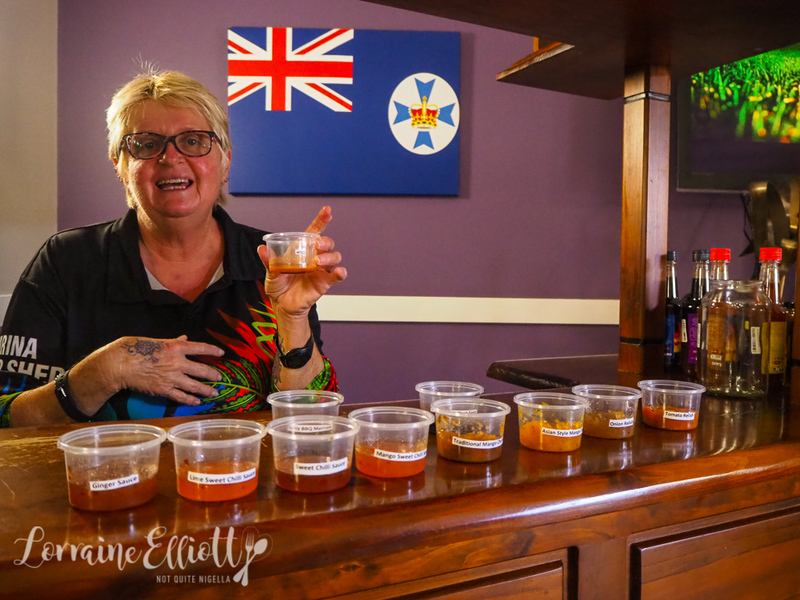 Trudy then shows us the difference between molasses, treacle and golden syrup. Molasses is most concentrated in terms of water but it is also the least sweet. Treacle has more water and sugar while the highest level of sugar and water is with golden syrup. And that brings us to a very interesting point-did you know that raw sugar in Australia is not actually raw at all? Food standards have ruled that for Australian consumption no sugar can actually be raw. So raw sugar is actually refined sugar that has an additional process to add molasses into it to make it taste like a raw sugar and is actually more refined than white sugar! And most of us I think would assume that we're doing better by using raw sugar. After blowing our minds with that tidbit we adjourn back to the video room where we get to try all of the products that they produce from chutneys to sauces. I particularly love the ginger sweet chilli sauce and the Asian style mango chutney. All items are gluten, colour and preservative free. Then she takes us through the alcoholic spirits and the various rums offering us any to taste. The special edition rum is smooth and sweet and spicy while the Noi (Nice over Ice) is perfectly balanced limey deliciousness. 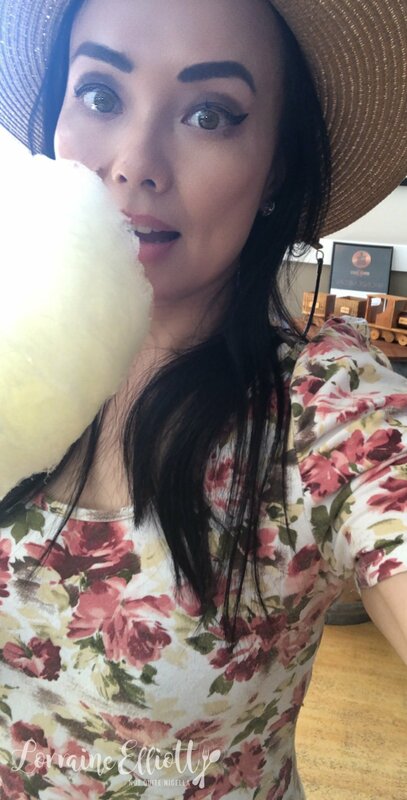 And then Trudy asks us if we'd like a freshly made fairy floss. I don't think that this day could have gotten any better but it does! 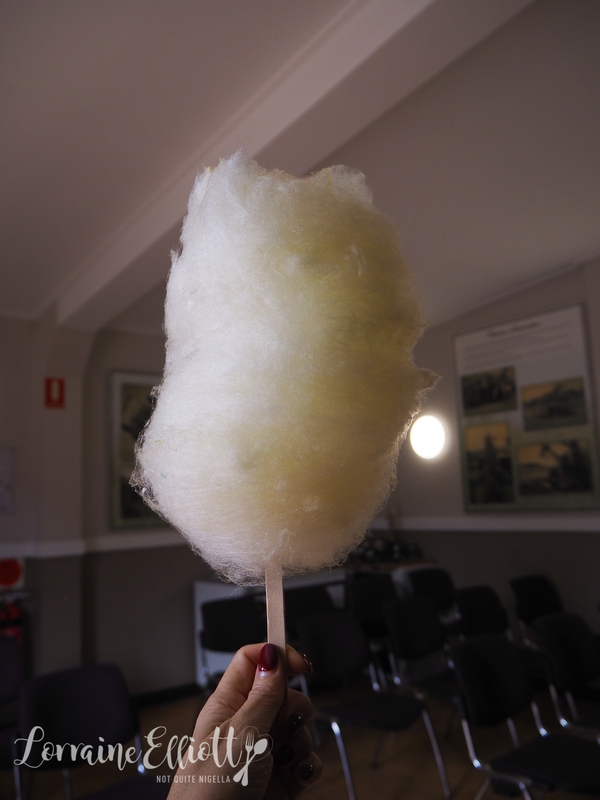 We are transformed into kids again with our very own stick of lemon fairy floss. We head back to the town area. The Riviera Mackay is the home for our second night in Mackay. Located right by the River the atmosphere here is a bit more relaxed than in the centre of town. 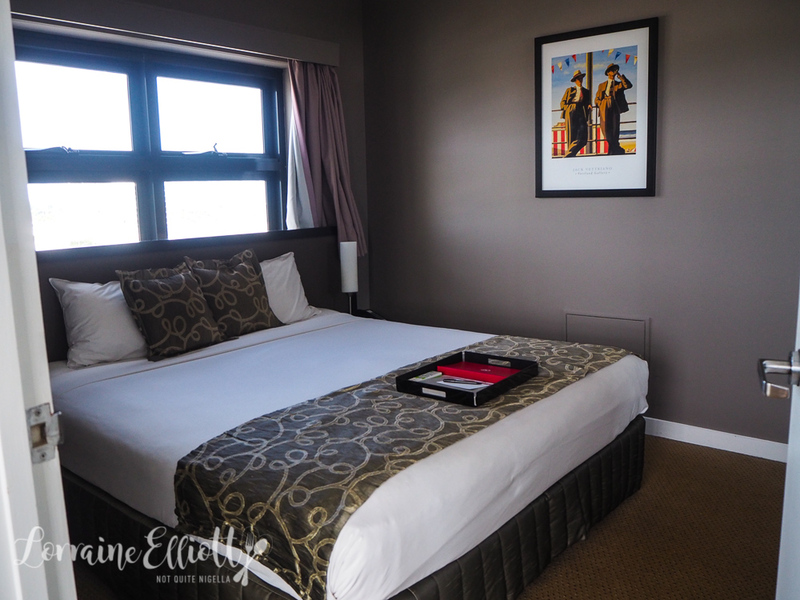 Check in is smooth, parking is easy and we quickly find our way up to our seventh floor two bedroom apartment with two separate bedrooms and two separate bathrooms. The accommodation is a really pleasant surprise. 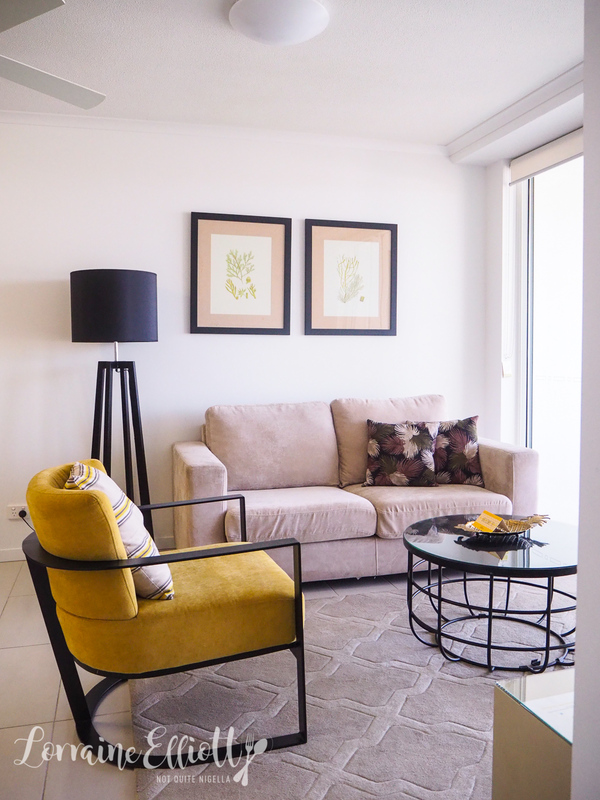 They are serviced apartments with a kitchenette which we never tend to use as we eat out. But the colour scheme is visually appealing with whites, yellows and pineapple motifs and plenty of neutrals. 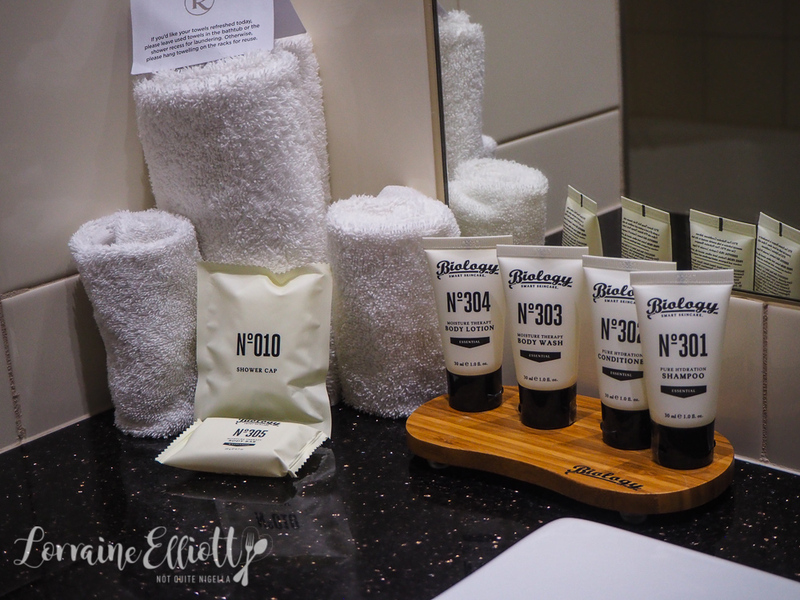 There are nice touches like L'Occitane toiletries. The apartment is roomy with a good sized balcony. Internet is fast and free but drops in and out and Ivy isn't able to connect at all. I have a shower and do some work and then we head out again to dinner. Tonight's dinner is at Romeo and Juliet's at the Shakespeare Motel. We sink into a powder blue velvet booth that oversees the whole restaurant and Ivy whispers that she feels like Tony Soprano. As the name suggests it's a rather romantic restaurant. I'm guessing a birthday or anniversary sort of place although it looks like there are guests that are staying at the motel dining there. 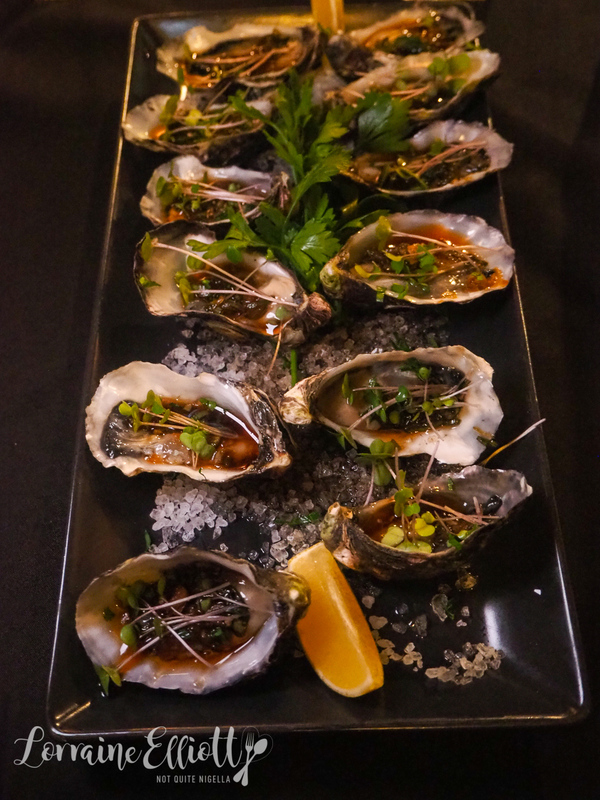 We start with a dozen oysters with soy, mirin and ginger. They're nice although the soy does tend to overpower the flavour of the oysters. Given we've eaten 10 courses for lunch we go for a lighter dinner. We decide to share a Caprese risotto entree and a pasta main. The caprese risotto ends up being my favourite dish of the night. 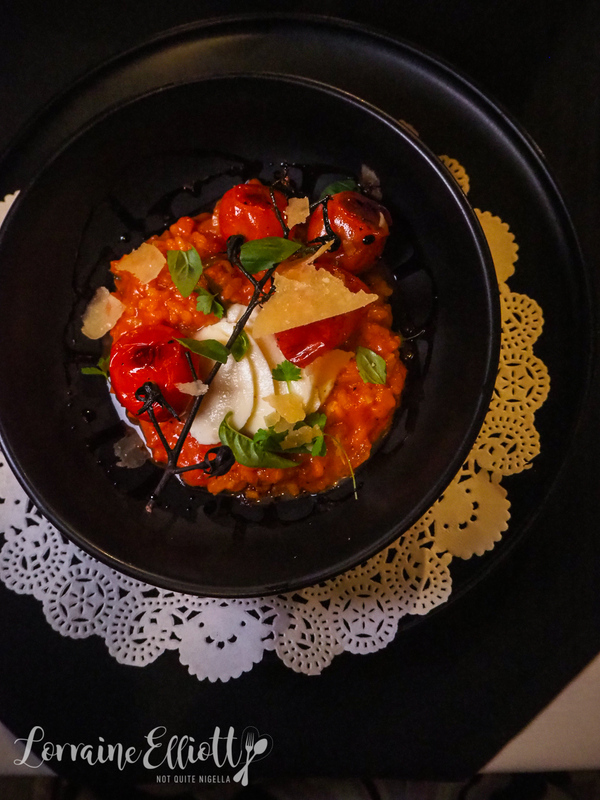 It's a tomato based risotto with plenty of flavour, sliced up buffalo mozzarella and roasted red vein cherry tomatoes and micro basil. I would have happily devoured this perfectly portioned size dish. 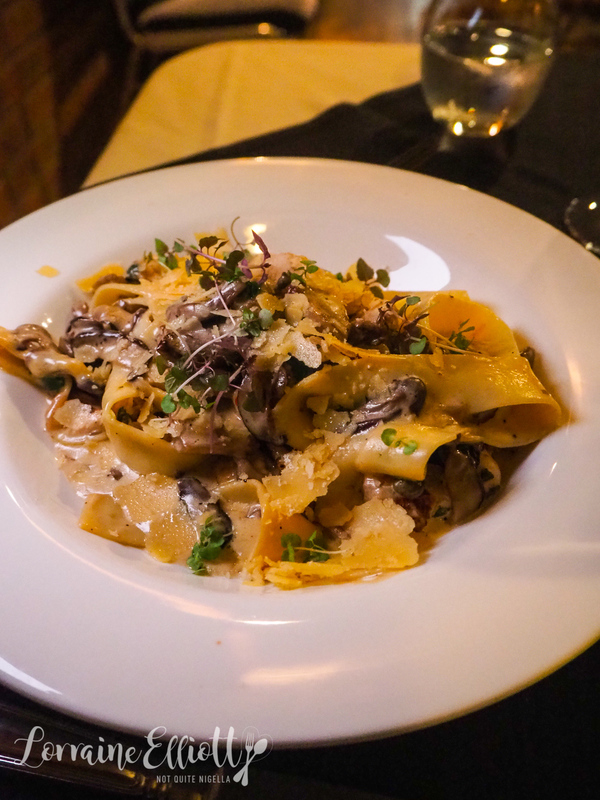 We also order the pappardelle with shimeji and shiitake mushrooms in a cream sauce. It needs a little seasoning but it is comforting and the pasta well cooked. 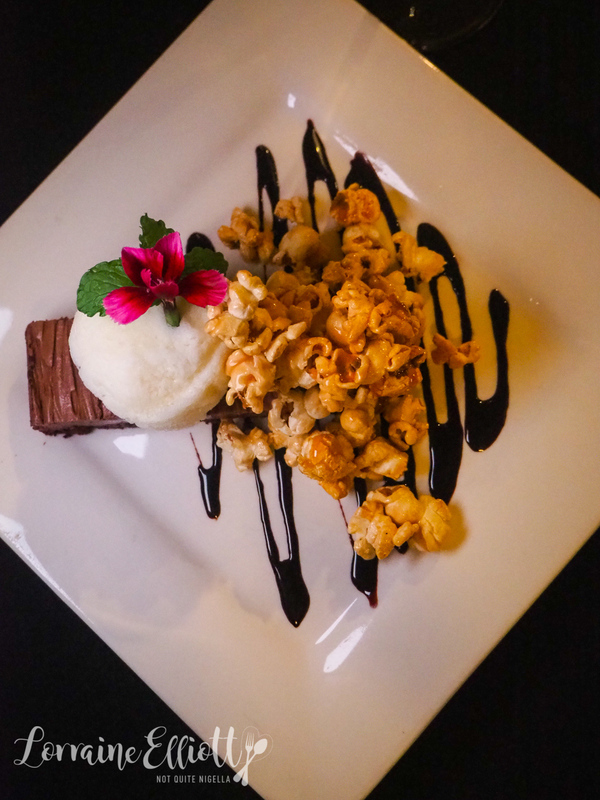 Dessert is a chocolate pave slice, with sticky caramel popcorn and a popcorn sorbet which is a milky, mild sorbet with a touch of butter flavour. There's also a raspberry and yogurt terrine which is Ivy's favourite. 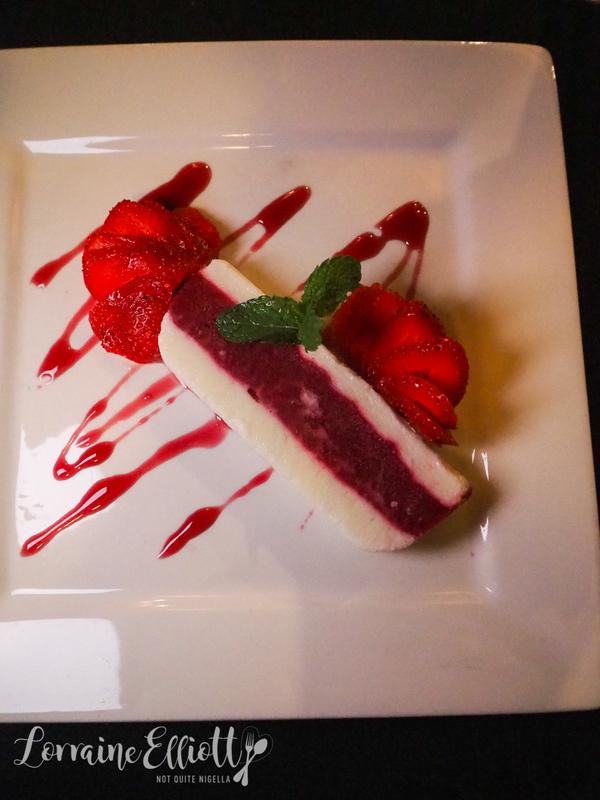 It's tart and refreshing and served with fresh strawberries. It's a quick drive back home to rest and sleep before we head to our next stop! Stay tuned because up next Mackay has some nature surprises in store for us. 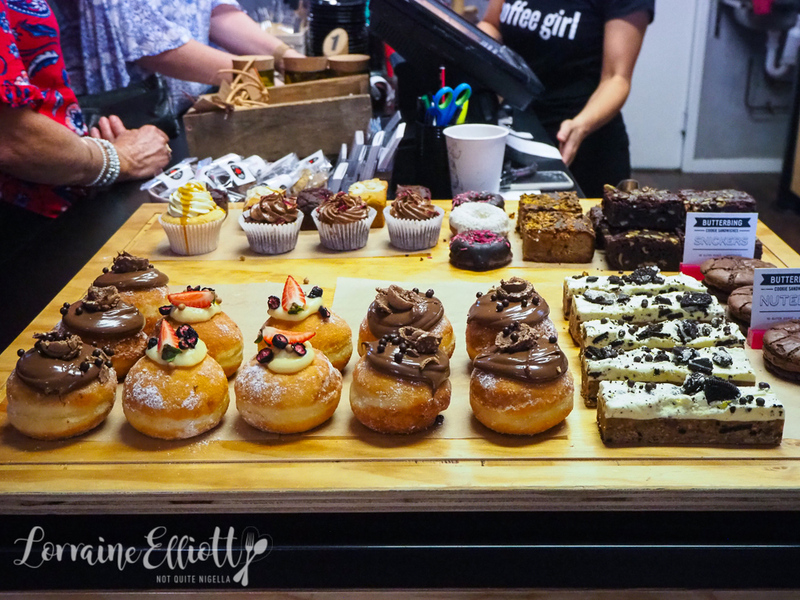 So tell me Dear Reader, do you like doing food tours like the sugar tour? Did you know that about raw sugar not being raw at all? 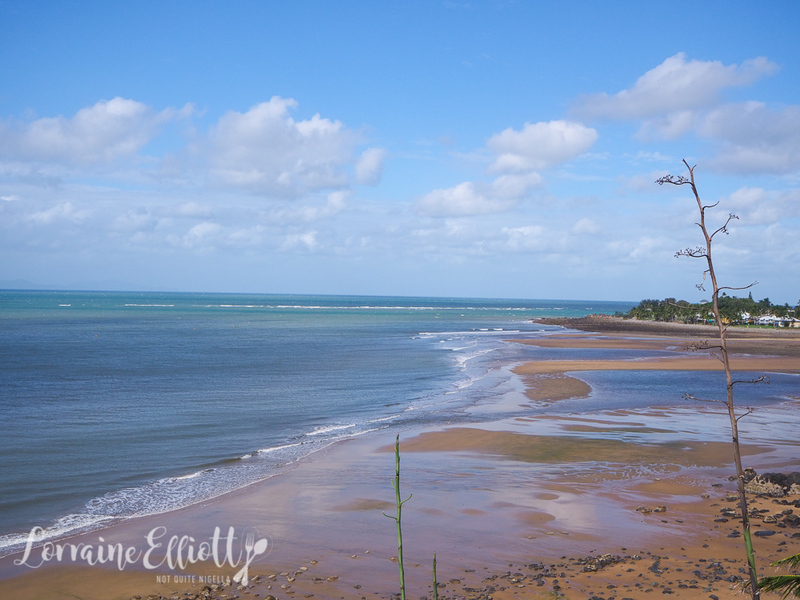 Have you ever visited Mackay? 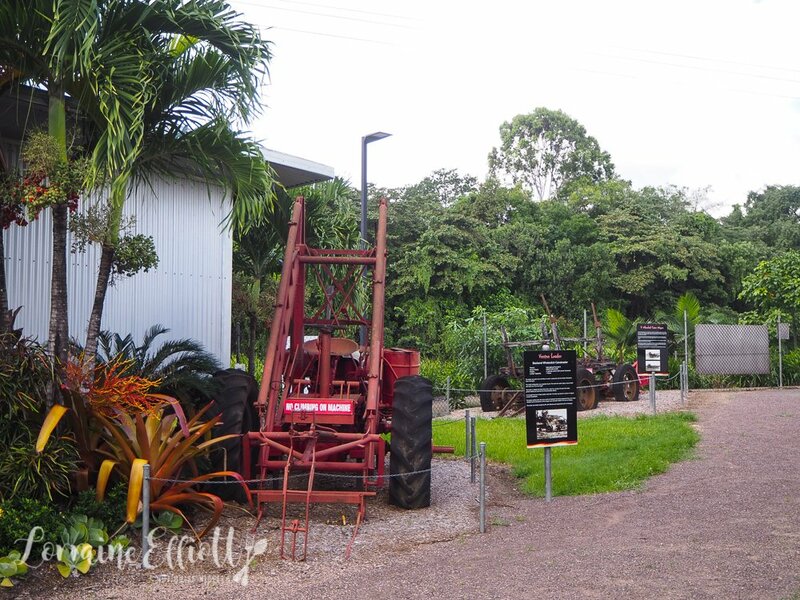 NQN and Ivy were guests of Mackay Tourism but all opinions remain her own.